Roll Top Backpack, made of canvas and genuine leather Stylish urban Roll Top Backpack with a screw top, made of thick canvas with genuine leather and nylon. The main compartment of this bag holds documents A4 size, 15 in laptop and all the necessary things in everyday life. However, an additional the function of promotion of the roll allows to increase the internal space of the backpack. The bottom of the backpack is sealed and fully finished by leather. For easy portability there is a leather handle. Adjustable shoulder straps made of cotton strap and genuine leather. The back wall of the backpack is additionally sealed with a soft insert that reduces stress on the back. On the outside of the backpack there is one large patch pocket, made of nylon, fastened with a zipper. Inside the bag there is cotton lining with pockets for small items, valuable devices and documents. 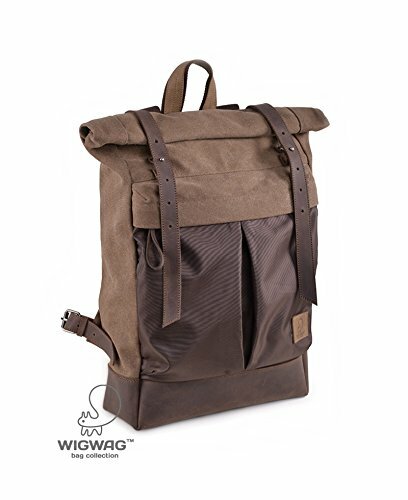 This versatile and stylish urban roll top backpack will be easy to match with any casual clothes, and an additional the function of promotion of the roll will hold all necessary things while traveling, hiking or on a picnic.Overall size: height - 17,3" (44 cm), in promotion - 21,6" (55 cm); width - 11,8" (30 cm); the bottom - 3,9" (10 cm). If you have any questions about this product by TM Wigwag, contact us by completing and submitting the form below. If you are looking for a specif part number, please include it with your message.